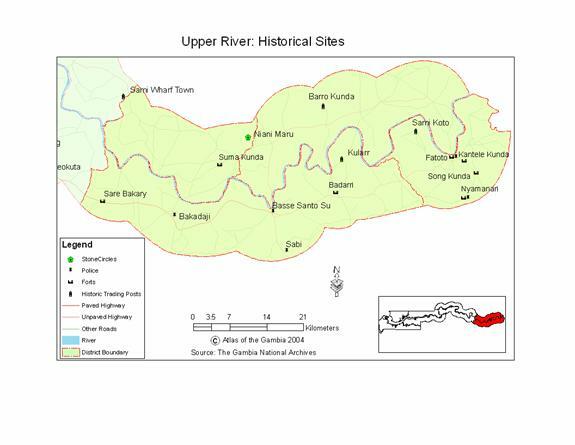 Upper River Division, occupying about 2000 sq km is the second largest division in the Gambia. The division has 4 districts, namely Fulladu East, Kantora, Wuli and Sandu with the headquarters in Basse Mansajang Kunda. The largest and most populous district is Fulladu East. Occupying 39% of the total land area of the division, the district is home to 53% of the residents in the Division with population density of 125 persons per sq. km about national average. The second most populous district is Wuli, the largest of the two districts on the north bank of the Division, with 19% of the divisional population. Sandu district is the least populated in the Division with a population density of 31 persons per sq. km. The population of Upper River Division in 2003 is 182,586 an increase of 18% from 1993. 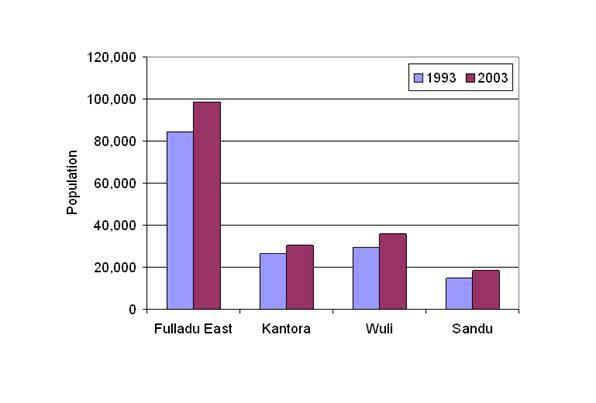 The distribution of population varies across the division with over with 70% of the population living in the two south bank districts of Fulladu East and Kantora. Only one of the 10 largest settlements in the division is on the north bank of the river. The largest town Basse is also the commercial center of eastern Gambia. Over the year Basse has become important transit point for goods going to eastern Senegal, Republic of Guinea and Mali. Like Central River Division, agriculture and livestock is the main livelihood in URD. Fulladu East is a major livestock production center. Extensive floodplains in the Division have led to the expansion of irrigation rice production in many areas. Within the upland areas, groundnuts, millet and maize are the dominant crops. In efforts to diversify agriculture successive governments have promoted commercial production of cotton although with limited success. URD has two major health centers and two minor health centers with no referral hospital of its own. Relying on Bansang in Central River for Hospital services, access to healthcare is major challenge in many parts of the division. Until mid-1990s the division's only High Schools are in Basse.